Today we celebrate our 3 Year Anniversary as an Assassin's Creed Fan Community! We would like to take this opportunity to thank everyone who has supported us and our content over the past three years. It means a great deal to us to see so many Assassin's Creed Fans coming together and sharing their thoughts in one place. With nearly 12,000 fans on Facebook, 3800 on Twitter and 700 on Instagram, we are extremely proud of everything we have achieved so far. I was lucky enough to attend Gamescom 2016 as a Ubisoft Star Player. It was an absolutely amazing experience, and I met so many great people! In August of 2016 we began logging all Assassin's Creed Movie Cosplay Projects we could find! This was a big task, taking 5 months to complete, but was definitely worth it. Irakli and Sofija helped to organise the 2016 Assassin's Creed Marathon, which was a huge success. Congratulations to everyone who completed the Marathon! I attended Chester Comic Con and had the opportunity to meet Neil Edwards, Artist on the Assassin's Creed Titan Comics. Our Admin Sofija had the opportunity to visit Italy, and saw many of the landmarks visited by Ezio Auditore and the Italian Brotherhood of Assassins. Assassin's Creed Movie Merchandise Guide. The Assassin's Creed Movie Merchandise Guide was created to help fans locate and buy Movie related items. I was lucky enough to get an invitation to the Assassin's Creed Movie Fan Screening in London. I absolutely loved the Movie, and had a great time in London with other Assassin's Creed Community Members. We Interviewed Patricia Summersett, Voice Actress on the Assassin's Creed Franchise. She plays Hope Jensen and Galina Voronina. Our talented Graphic Designer Irakli (McHeisenburglar) rebooted the graphics for The Ones Who Came Before. We now have a new Logo, and regularly update our Social Media Banners! We Interviewed Nadia Verrucci, the voice actress behind Juno in the Assassin's Creed Franchise. Irakli and Sofija have helped to organise the 2017 Assassin's Creed Marathon, an ongoing Community Project. I recently attended MCM Manchester Comic Con. It was the first time I had attended the event, and made it my goal to find all of the Assassin's Creed Cosplayers, all of which looked amazing. ​We celebrate our 3 year anniversary as an Assassin's Creed Fan Community, and begin our fourth year! To celebrate our third anniversary within the Assassin's Creed Community, we have been working tirelessly on a number of Assassin's Creed Projects that we can now reveal! We hope that you enjoy our Anniversary Projects, and continue to support us as we enter our fourth year. 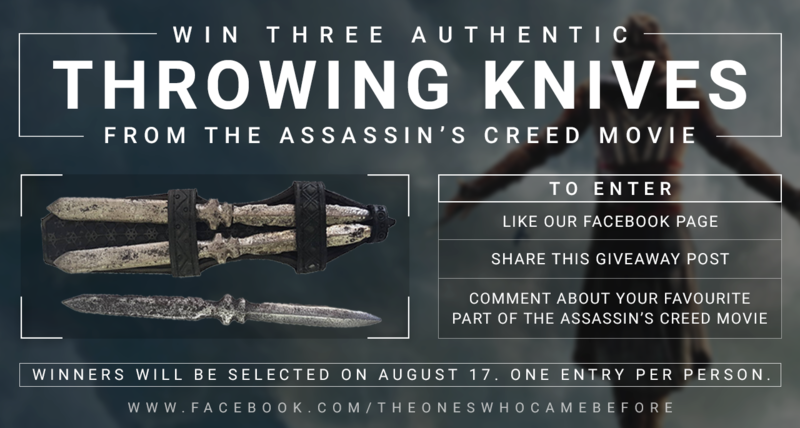 Our First Giveaway takes place on our Facebook Page, and gives one lucky fan the chance to win Three of Maria's Throwing Knives from The Assassin's Creed Movie! The Throwing Knives have kindly been donated by Damage Inc. The Giveaway is open Worldwide, and only one entry is permitted per person. ​ To enter our Assassin's Creed Movie Giveaway. Upon completing all three requirements, you will be entered into the draw. To celebrate our Third Anniversary, Ubisoft have kindly donated a variety of amazing Assassin's Creed Prizes! This Giveaway can be found on our Twitter account, and gives three lucky winners the chance to own Assassin's Creed items! We have separated the prizes into three bundles, meaning this competition will have 3 lucky winners! We would like to thank Aymar Azaizia, Antoine Kavinsky and everyone at Ubisoft who made this Giveaway possible! ​Upon completing both requirements, you will be entered into the draw! For our third and final project , we interviewed Abubakar Salim, who plays Bayek in Assassin's Creed Origins! - We're hoping to attend more Gaming Events in future, giving us the chance to meet Community Members around the world! - More Articles on everything Assassin's Creed. - More Competitions, and opportunities for Fans! We hope you that enjoy the three Assassin's Creed Projects we put together for the Community! Thank you for all the support, and we will continue our work as we enter our fourth year as an Assassin's Creed Fan Community!